Where does the time go? Growing up in the Catholic Church, following the seasons of the church is a very familiar routine for me. I have memories of lighting an Advent Wreath with my mother, but not with my whole family gathered. The wreath was displayed more as a symbol of the season, part of the regular Christmas decorations my mom so meticulously put out each year, than as an element of discipleship. But I also remember that it wasn’t a family event to sit by the wreath, light a candle, and read a devotional. 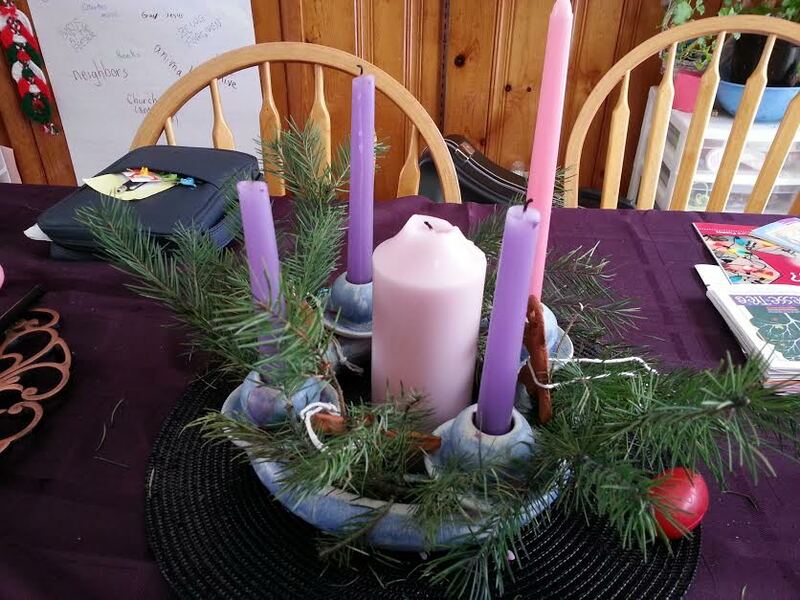 My husband Steve’s background is Nazarene, and while he was familiar with the names of the church seasons, there was nothing like an Advent wreath in his home growing up. Christmas, when God came among us, was pretty much a stand alone holy day. In the early years of our marriage, we weren’t attending church and therefore not following any calendar other than the usual 12 month one. After a search we began attending a United Methodist church, which retains more or less a liturgical heritage, and I wanted to again display an Advent wreath. This was several years into our marriage and I recalled, then, that we had actually received an Advent candle holder as a wedding gift. I remember thinking when I first opened it that it was a beautiful 4-candle holder, but at the time had no idea what it was for other than a pretty centerpiece that went with no furniture that we owned. It turned out to be a providential gift. As our children grew older, I wanted to begin taking time out of the day to study the Bible with them using devotionals. Our church gave out different ones during the year with special ones for Advent and for several years I took them graciously and brought them home just to be lost in the abyss of our house. By and by, each year we managed to do a little bit more of the readings during Advent – our percentage of pages actually read increased. I think the first year it was Sundays only, just to light the additional candle (we were reminded to do so that morning at church). And then life would move forward, back into the regular hectic routine, with God again pushed to the background until His day came by again. But, each year at Advent we added to the time we set aside to read and discuss a bit of scripture. It’s been a frustrating process, trying to fit in family devotional time, not the least because of our difficulty of actually being able to spend time together before rushing to the next event or blessed bedtime. Advent really has become the consistent time we can sit together and talk about the Bible, reviewing the promises of God leading up to our Savior’s birth and our own responses to Jesus. Over the decade that Steve and I have been introducing our sons to God through the different sit-down devotionals, we’ve reached the point where the boys now will usually respond to the questions in the readings with appropriate examples. Better still, they’ll add other bits from the Bible that relate to what the daily reading is. Though only our eldest has taken on a proper Bible translation to read (illustrated versions are highly popular with all three), it warms the heart and lowers parental anxiety to know that a foundation based on God revealed in the Bible has started to form in each of them. I can only think God has taken those fitfully crowded times we’ve spent together with His word and made it His time. We are the Tylers, Steve, Colleen, Chase (13), Elijah (11), and Max (10), along with our two cats, Bowie and Leonidas. Steve is a firefighter and I teach 3rd grade. Between our work schedules and the boys’ schedules, it is a busy life we live. We are also very involve in Boy Scouts and in our church. When I met Steve 18 years ago I never envisioned being the mother of 3 boys; I always wanted 2 of each, or at least an even number of children. But, of course God had a different plan. Raising 3 boys is a daily adventure and that has exciting twists and turns and it always amazes us how different the 3 boys are. Chase is our brainiac 13 year old who thrives on knowledge-particularly useless information. He is a swimmer and plays piano. Elijah is the comedian of our family and brings the laughter into our chaotic world. He plays the trombone and likes to draw. Max is a combination of his two brothers and is constantly trying to find his place in the family (besides last born). He also swims and plays the tuba. All three boys are Scouts, love Legos and get in trouble at school for reading too much. Steve and I were raised in different denominations – he Church of the Nazarene and I Catholic. Early in our marriage we didn’t attend any church because I was not interested in religion at all. Then, when I was pregnant with Elijah, I felt a need to find a church. Neither of us was really interested in attending the other’s church so we shopped around and ended up becoming United Methodists. My own spiritual journey has been a bumpy road and I still feel like a baby Christian. Steve’s faith has always been strong, and his knowledge of the Bible astounds me sometimes. Our children each have their own level of faith and ask questions from time to time about it. We all attend church on a regular basis, but need more to help build our faith, both invidually and as a family. Our hope is these series of devotions will help us grow closer to God as we pray and study together. This is a new adventure we are looking forward to, it won’t be easy at first and may take us til Epiphany to get into a rhythm, but God willing, we will make it work.